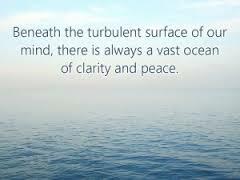 Without clear mind, there is no clear direction. The people would not know where to go, and it is as good as having no leader. 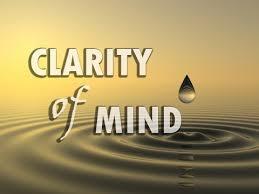 Having clarity of mind is the first and foremost. It is, however, not something easy to do, especially in time of uncertainty. How do you react to sudden surge of costs? What should you do when your major competitors suddenly cut their price? To maintain clarity of mind, try elimination. Reality is often shrouded in mist. Truths are often distorted by fine words, flattery and ego. Eliminate noises, so that you can stay close to reality. A clear minded leader is indifferent to glory and blames; flattery and criticism. He is keen on knowing reality. He is not easily perturbed. He chooses to face the reality sooner, rather than later. He will have to face the reality no matter how. Facing it earlier is more effective, as whenever possible he can nip the problems in the bud. How can you see an of tree image clearly in the water? The water must be calm, undisturbed. If the water is stirred, you will have to wait for it to stabilize, and mud particles in it to settle. Only when this happens that you can see yourself clearly in the water. 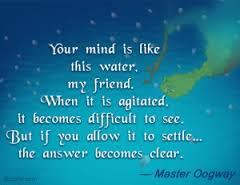 The same applies to clarity of mind. If you want to have a clear mind, remove distortions and noises. Stay calm, stay tranquil. Even if it is a split second! Yes. I mean even if it is a split second. This is especially when you have to make a decision fast. The more effective that you can calm yourself down, the quicker you can grasp the reality. When the desk is clean — you find what you want more readily.